It’s a new book out by my friend, Michele Muska! 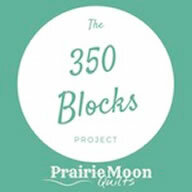 Michele asked 20 quilters to each create a quilt for the book. She chose 10 traditional patterns, and had each one made in a traditional version and a modern version. Then she chose images of vintage and antique quilts made from those patterns and included them in the book. 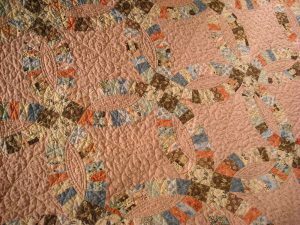 It’s amazing how these patterns have stood the test of time through all the generations of quilters. And how they manage to tie all those generations together! 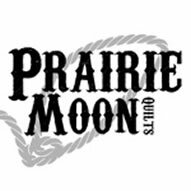 Each pattern, Double Wedding Ring, Crazy Quilt, Dresden Plate, Bear Paw, Log Cabin, Nine Patch, Hexagon, Yo-Yo, Flying Geese, and Rail Fence, comes with step-by-step instructions for two adaptations, one traditional, the other modern. 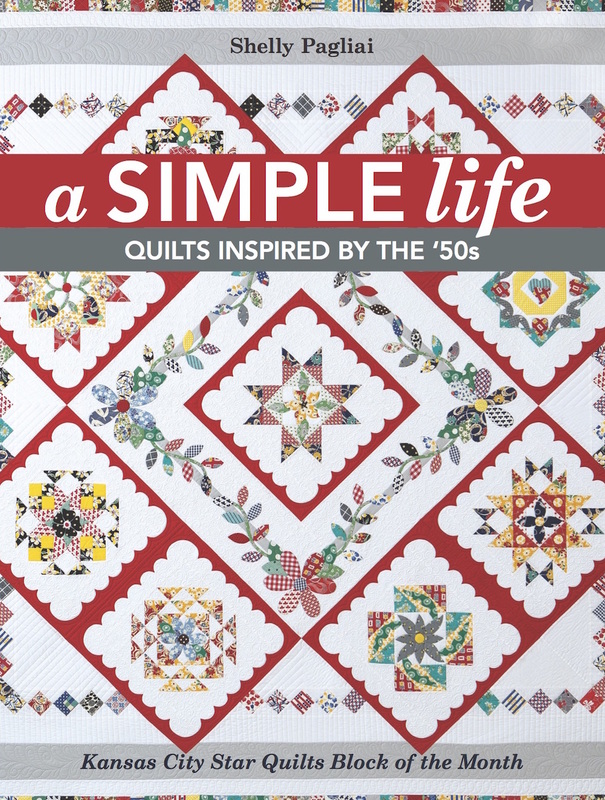 The book also includes a history of each pattern, and easy-to-use templates and essential quilting techniques. 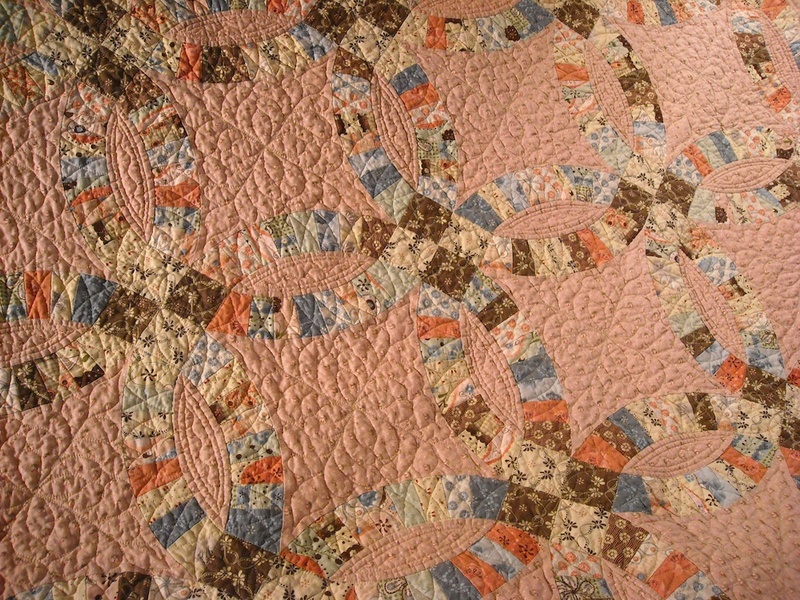 I’m honored to have been chosen to create the traditional version of the Double Wedding Ring quilt for the book. And Michele paired me up with none other than the Double Wedding Ring Queen herself, and my best friend, Victoria Findlay Wolfe, who created the modern version. Is this not the coolest picture? Here’s a couple more pictures of my quilt. I used the Twig & Grace fabric collection from Riley Blake to make mine. New modern fabrics in traditional colors — I thought it seemed appropriate. Mauve and blue — but not your Grandmother’s mauve and blue! And I love the touches of brown thrown in. Michele has agreed to let us each give away a copy of the book. So if you’d like the chance to win a copy, just leave a comment on this post. I’ll draw for a winner on November 7th. Michele will also be on Pat Sloan’s Radio Show on Monday, November 3, at 4 pm Eastern time, so be sure and tune in then to hear what she has to say about the book. And if you simply can’t wait to get your hands on it, you can purchase it HERE. Or if you’re running around at Quilt Festival in Houston today, you might be able to find it there! And if you also run into Michele, you could get it autographed! Don’t forget — leave a comment for your chance to win a copy right here. UPDATE: The winner of the book give-away is Laurie. 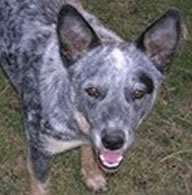 Congratulations, Laurie, and thanks to everyone for reading and playing along! Looks like a great book! thanks for the review and giveaway! Love that double wedding ring quilt! I’m not usually one for “modern” over traditional, but I love both versions of the wedding quilt! Always happy to build my library of quilting books. Thanks for the opportunity. It’s amazing how the patterns can look so different with the selection of the fabrics! This is a great book. The book looks like an awesome resource!! Love your quilt, it is beautiful!! I absolutely love that double wedding ring quilt you made!!! Love your choice of fabric. Looks like a great book to own. That looks like a very interesting book. Plus, you have a quilt in it! Thanks for the chance. Your version is beautiful! Love that fabric collection. Loved the colours in your quilt. Would like to try some of the patterns myself, thanks for the chance to enter to win. Oh I love those quilts! I need to check out that Riley Blake fabric line, so soft and pretty. Thanks for the chance to win the book! What a wonderful book. Congrats on being one chosen for a quilt in it. I love the double wedding ring in those wonderful colors. Having just finished a vintage Sunbonnet Sue, I am interested in the updates that could happen when we visit those old ones again!! Great job on that mauve and blue Wedding Ring, Shel. Love the differences between the traditional and modern!!! This looks like a fabulous book – thank you for the opportunity to win it!! This book looks great! 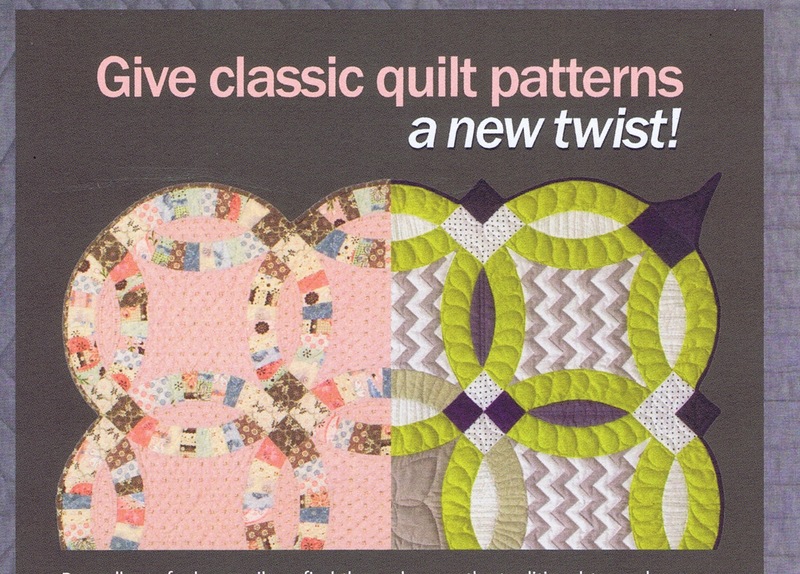 I love traditional patterns, but appreciate the modern spin quilters are taking too. I love bright and cheery modern fabrics, but there is something to be said for the homespuns and calicos! Thanks for your beautiful wedding ring-something I have yet to attempt! Your version is stunning! I’m not a pink or mauve person, but it definitely makes that quilt and I love the touches of brown too. You did an awesome job of stepping back in time with a timeless design. Interesting concept. The samples I’ve seen have all been terrific. Riley Blake’s Twig and Grace is perfect for your wedding ring. What other fabrics did you consider? Beautiful quilt. I so want to make a double wedding ring quilt and your version makes me want to do it in the same colors. So soft and pretty. Great Job. I’ve always wanted to make a double wedding ring quilt! I love the colours you’ve used in your Wedding Ring quilt. Congratulations on having your quilt in the book! That is an interesting picture, with half of each. I really prefer yours, but I can see the appeal in the modern one. Thanks for posting about the blog hop. And thanks for the chance to win a copy of the book. It looks amazing! Thank you for a chance to win this book. It looks great! I love the wedding ring pattern! I love the idea of traditional patterns made modern! I like the quilting on your too! I love your quilt! I didn’t realize that it was recently made when I first saw it – it looks so vintage! I love your fabric choices for the Wedding Ring quilt; a perfect blend of modern and traditional. I love the side by side comparison of the styles. I really like both quilts and do like the brown in yours. That’s a lovely DWR quilt that you made. And I love Victoria’s quilt too! Yours has a real vintage feel. I so want to have a copy of the book in my hands. I’m sure it will be so inspiring! I am so excited for this book to come out, it looks like it will be gorgeous. Thanks for the chance to win! I love the look of your double wedding ring. This project was a wonderful idea for a book. I can’t wait to get a copy. Thanks for the chance to win. I’d love to win a copy. Looks like a neat book. This book looks amazing! 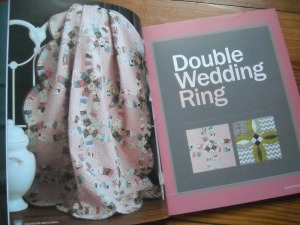 Love both wedding ring quilts! 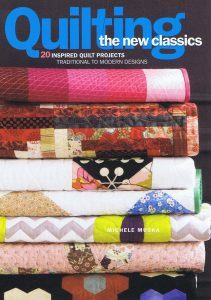 I love your quilt – this looks a great book! A DWR has been on my list for far too long – your beauty has put it on the first spot again. Thanks so much! Double wedding ring is on my list of Someday Quilts. Thanks for the giveaway. This book would be a great addition to my quilt library! Nice concept of old and new! Looks like an inspiring book! I tend to like the modern quilts and having the contrast of the modern take on the classic patterns is very interesting. Your quilt is lovely. The DWR is on my bucket list, beautiful. However, the new version looks pretttty interesting, too. I’d love to win the book! I would love to win a copy. Great idea for a book! This looks like such a great book. What a collaboration! Luv the modern take. I love the concept of this book. Your quilt is beautiful! So neat to see the two quilts side by side! How different! You did a wonderful job on your traditional wedding ring quilt! Your quilt is gorgeous. What a great idea for a book. I would love to make so many of the quilts in it. this book looks amazing! thanks for the chance to win! This pattern has always been a favorite of my mother. Still wonderful after all these years. This looks like an absolute must-have book which I’ve already added to my Christmas wishlist. Your quilt is beautiful and the book’s concept is amazing. Can’t wait to win it and/or purchase it (Christmas gift to me!). Thanks for the great post and a chance to win. Beautiful beautiful quilt! 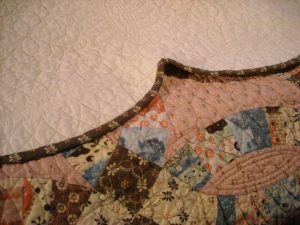 My husband and I sleep under a double wedding ring quilt made by his great-grandmother (completely by hand) every night and I love looking at all the fabrics and beautiful quilting. I love everything I’ve been seeing about this book so much! Your quilt is beautiful- – I love the colors you chose. This book looks like fun. This book looks like it is full of inspiration, thanks for the chance to win! This book is a fun idea…I love traditional but modern is creating a new wave of quilters…would love the book to see how they are compare. Your quilt is a beauty!